Whatever your cleaning needs, you can be sure that we can help. We provide a full range of cleaning solutions for domestic and commercial cleaning needs, throughout all London areas. Here’s just a selection of what we offer. Commercial cleaning: when your office is clean and tidy, your workers will feel happy and motivated. Tripping hazards will be removed, and desks will be organised. It’s a great and inexpensive way to improve staff productivity. Fast Cleaners Brent are commercial cleaning experts. We can clean all areas, from desks and carpets to toilet and canteen areas. Even external areas can be cleaned. You won’t need to put up with smoking areas covered in wrappers and cigarette butts. Our commercial cleaning service can be used on a one off basis, or we can supply contract cleaners on a daily, weekly or monthly basis. Our cleaning company pride ourselves on the punctuality and reliability of our cleaners. It’s a service that you can trust. Window cleaning: take a new look at the world, through dazzlingly clear windows. Your windows have to put up with a lot. Every day they are attacked by pollution from motor vehicles, as well as being battered by rain, wind and snow. It’s no wonder that they can become unclean so quickly. London’s windows are some of the dirtiest in the country, but yours don’t have to be. We’ll give your windows a thorough clean, on all floors. Whether you have a flat with 3 windows, or an office block with 300 windows, we can do it all. Your rooms will seem brighter, and everything will take on a fresher appearance. House cleaning: do you like to throw dinner parties, or invite friends around for coffee or a glass of wine? When you’re not in the room, they’ll run their fingers across door frames, or the tops of cupboards. Imagine the look on their face, when they find not a single trace of dust. We’ll give you a home that the Queen would be proud of. Our expert cleaners will dust all your surfaces, tidying as they go. They can also help with washing up, polishing and ironing. You’ll never singe a blouse again. Our house cleaning service is perfect for landlords as well. Having property that’s in perfect condition will entice high quality tenants to rent your rooms. It’s an investment for your future, and a great value way to make your property stand out from the crowd. Carpet cleaning: carpets look great, they make a room seem warm and comforting. Especially when it’s warm outside. But it’s not just humans and pets that love carpets. 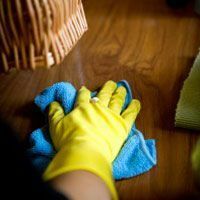 Dust mites like nothing better than making a home in your carpets and rugs. Our carpet cleaners will blitz your carpets, removing dust mites and leaving them cleaner than ever. It can be a breath of fresh air for people who suffer from asthma or allergies. We use the highest quality equipment, and cleaning supplies from leading brands. We believe in cleaning corners, not cutting corners. Feel free to call us on 020 3322 4794 to ask for our cleaning prices or book this service through our online ‘service request form’.